In the morning, you have a nice cup of coffee after waking up. The afternoon may bring a craving for an ice-cold cola. After a long day at work, all you want to do is sit down to dinner and maybe a glass of wine. However, all of these choices could be making your hot flashes more frequent or more intense. 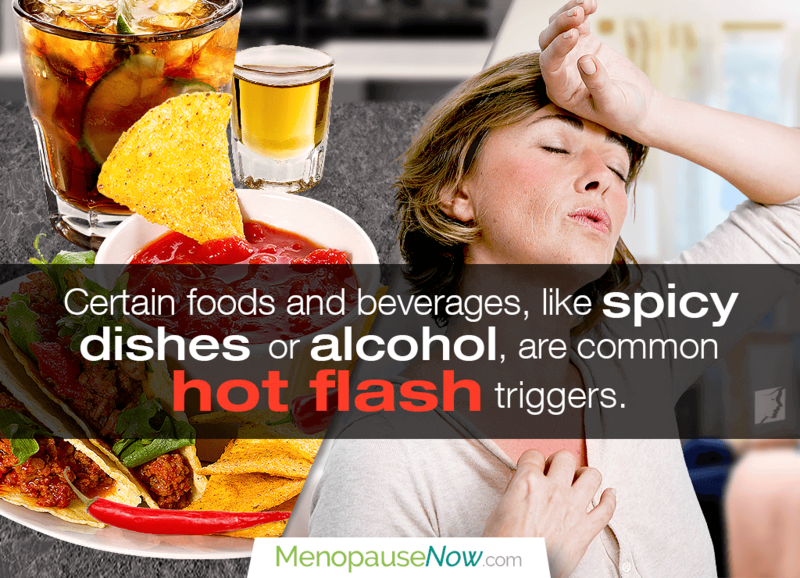 Even if you feel you're making healthy diet choices, you could be eating or drinking something that triggers a hot flash. Why Do I Feel a Hot Flash After I Snack? Some drinks are known triggers for hot flashes because of certain compounds they contain. Caffeine, for example, is a common stimulant found in coffee and tea. Unfortunately, these are both universal comfort drinks. Additionally, they're usually served hot, which can cause hot flashes as well. Even your sweet tooth could be contributing to your hot flashes. If you're indulging on chocolate bars every now and then, you're consuming caffeine as well. Why Do I Get Hot Flashes After Dinner? After checking coffee, tea, and chocolate off of your list, it's time to move on to foods that are more obvious. These include spicy dishes such as curry sauces, hot salsa, and heavily seasoned dishes. Even for men and non-menopausal women, these kinds of dishes can trigger flushing, sweating, and increased body temperature. But for women going through menopause, they make hot flashes more severe. Also, if you're one of the many people who enjoy a glass of wine or a beer during or after dinner, you're potentially setting yourself up for an uncomfortable evening of night sweats. The effect of alcoholic drinks is two-fold: they cause blood vessels to expand and release heat while also making estrogen levels fluctuate rapidly. Are There Any Hidden Causes of Hot Flashes After Eating? While any spicy food can trigger hot flashes, peppers are perhaps the worst culprit. This is because peppers have capsicum, a spicy compound that puts the heat not only on the average eater, but especially on women experiencing hormonal imbalance. Processed sugars and simple carbohydrates, which are broken down more quickly than complex carbs when consumed, can also set off hot flashes. In general, women who consume a high-sugar diet are more likely to experience hot flashes after eating than those who consume sugar sparingly. All of the foods listed here are potential triggers. Every woman is different and responds to different stimuli. Try cutting one of these things out of your diet at a time to see if there is a noticeable effect on your hot flashes. Keep a journal of what you consume and when you get hot flashes to see if you can identify your own personal triggers, and learn more about treatments for hot flashes. When you know how to gear up and keep calm, hot flashes will not be nearly as frequent or severe. Read on to understand the effect that diet has on the occurrences of hot flashes, and discover which vitamins will help keep hot flashes away. Hot flashes are the most common symptom of menopause, but they can be triggered by things like caffeine, stress, and alcohol. Keep reading to learn more.